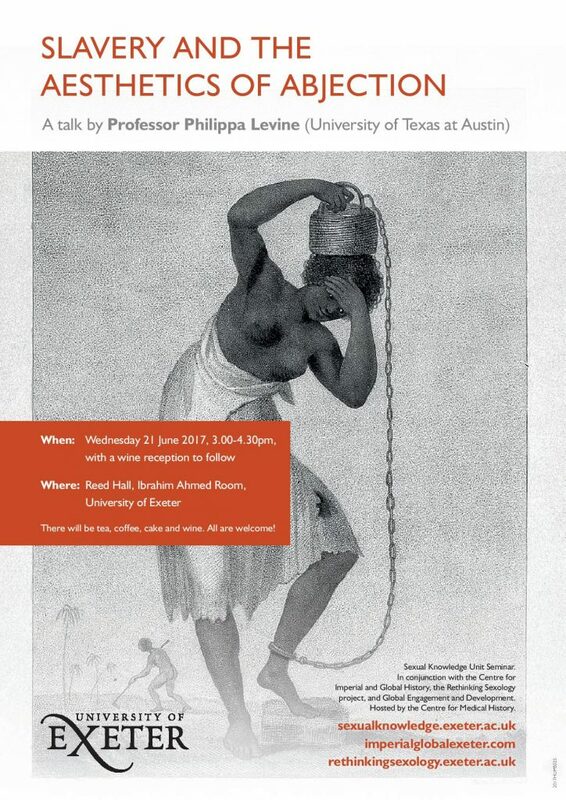 Last month we were joined at Exeter by Professor Philippa Levine from the University of Texas at Austin who spoke to us on “Slavery and the Aesthetics of Abjection”. This was a seminar organised by the Centre for Imperial and Global History and the Sexual Knowledge Unit, with support from Global Engagement and Development. Philippa, who is currently the Walter Prescott Webb Chair of History and Ideas at UT Austin, will be known to many for her wide-ranging work on the nineteenth and twentieth century history of imperialism, gender, sexuality, prostitution, medicine, eugenics and the professionalization of the study of the past. Her new project which she discussed with us is exploring the eighteenth and nineteenth century history of nakedness. In this paper she focused on nakedness in images of slaves and slavery, drawing particularly on the visual record of enslavement. For Levine such images draw on what she terms an aesthetics of ‘abjection’, and she charted the various visual markers of marginality and loss. Levine argued that the absence of clothes on images of slavery created a range of tensions and difficulties, complicated by an aesthetics of the naked white body that could be both highly eroticised and at the same time civilized, beautiful, pure and dignified even where that body was itself enslaved (as in highly eroticised orientalist images of Middle Eastern enslavement of white women, such as Power’s ‘Greek Slave’).. The nakedness of black bodies marked them as ‘huddled and defenceless’, lacking in dignity, devoid of personhood or history. When abolitionists produced their own images of slavery, inevitably clothes were added, to humanise the image in a way which nonetheless reproduced a form of voyeurism as a humanitarian tool that remains relevant and prevalent in the modern world. Much of Levine’s talk considered the politics of viewing and critiquing images of slavery. She asked how and under what circumstances the historian can study, comment upon and reproduce images of slavery, and whether or not such actions reproduced and enact afresh the violent abuses of the past. How far, she asked, is the continued analysis of images of slavery an ongoing participation in oppression? Alternatively, is the avoidance of this work itself a contribution to the continued silencing of the marginalised. Our anxieties about the images of naked black, tribal, non-Western bodies remains in ways that continue to reveal our obsessive aestheticisation and sexualisation of the naked bodies of white women. The talk finished with a plea from the speaker for historians, as consumers of visual imagery today, to recognise that our attitudes to the naked body have been conditioned by a long political (and theological) history and our view of slavery shaped even more recently by colonial past, and that we should at all costs avoid averting our gaze or our critical eye from images showing the violence of previous injustices and hurts.